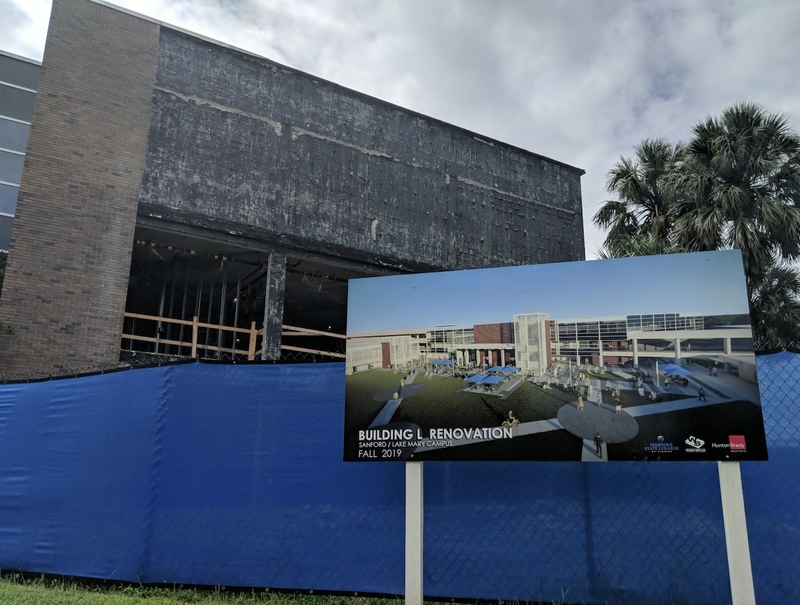 The final phase of renovations to Building L on the Sanford/Lake Mary campus are underway and expected to triple Seminole State College’s capacity to offer academic support to students. The current phase started in May as the final part of the college’s Capital Improvement Plan. The renovations feature the addition of a new Academic Success Center. Before its temporary relocation to its current spot in Building J, the Academic Success Center was located on the first floor of Building L.
Dr. Stephen Summers, associate vice president for the School of Arts and Sciences, said the orig­inal location allowed the Center to be easily ig­nored by students. Additional renovations include a cafe, new “smart” classrooms, and upgrades to existing classrooms. Also, according to blueprints from Hunton­Brady Architects, there are plans to pave part of the area surrounding the outdoor stairwell. The “hardscape,” as it’s referred to, will be furnished with dining tables, moveable furniture and some table games. The $32.1 million capital improvement project has been in progress for more than ten years and is expected to be completed in July 2019.